With everyone trying to make the most of their rifles capacity to stay on target during competitions we look to adjustable gas systems to help get us there. 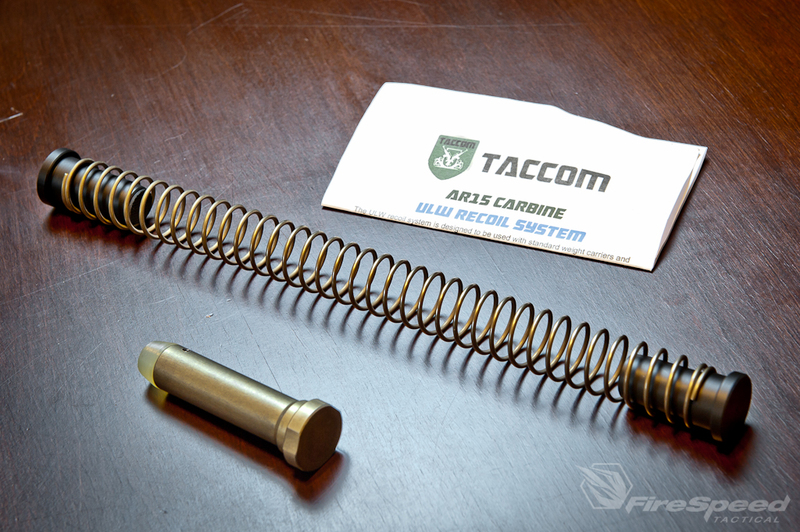 If you are constantly changing up the ammunition used in your rifle, an adjustable gas system may not be for you. 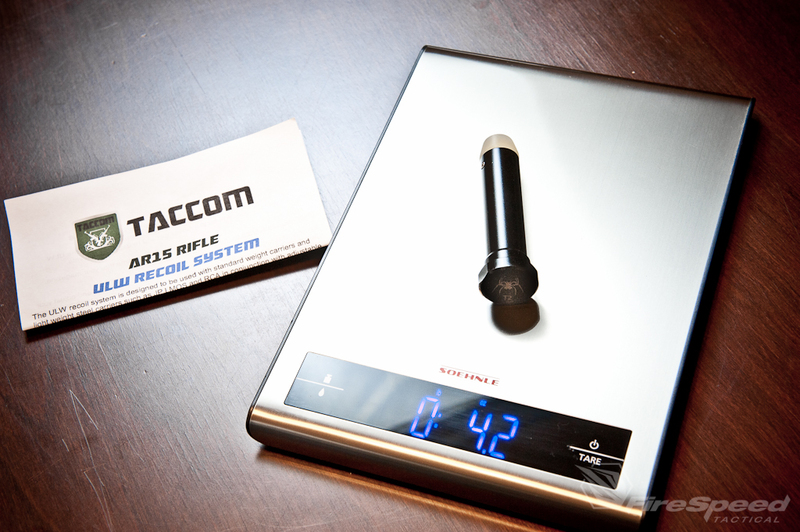 Because with an adjustable gas system you are now tuning your rifle/pistol to cycle with an exact amount of gas that your ammunition provides. By changing it around without adjustment you can damage your system or have it not function correctly. Once you have your adjustable device, whether it’s an adjustable gas block or an adjustable gas key, you can then start reducing your cycling action’s weight. 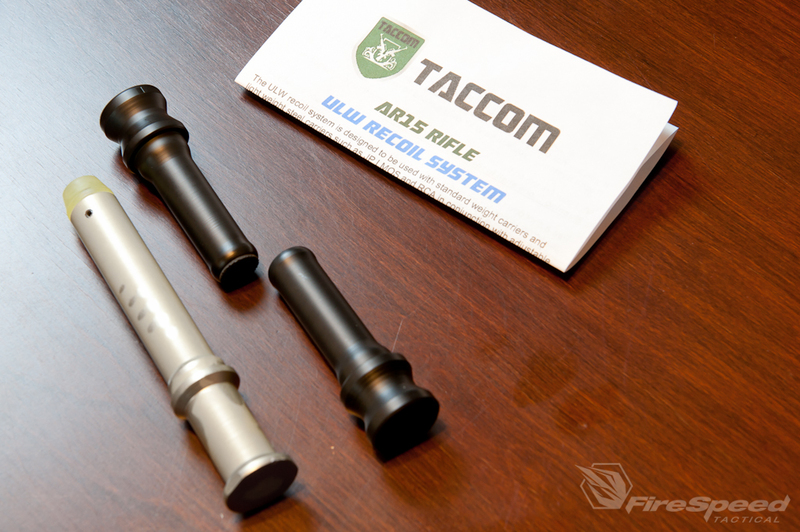 You can go with a lightened bolt carrier group, but be advised Taccom has not had the opportunity to test their system with aluminum or titanium carriers so they advise against using them. The ULW recoil system is only for use with lightweight steel carriers and adjustable gas systems or damage can incur. Now that you have reduced your reciprocating mass with a lightweight bolt carrier group, you can reduce the mass of your buffer system. 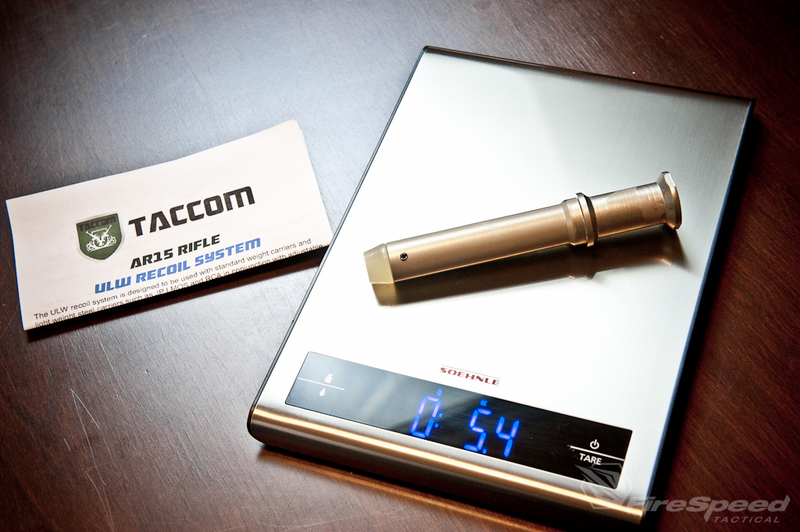 Enter in the Taccom ULW Recoil System. It is comprised of two pieces, the rear is recognized by the pad on it and the front is smooth on the corresponding side. So why do we have to do all this? The AR15, as well as most other rifle based systems are typically designed to be overgassed, hard cycling units to ensure that they will function with any ammunition you throw at it. The upside, increased reliability. Downside, you now have a cycling system that is going to be punching you in the shoulder every shot increasing your muzzle rise and giving you more to fight while you shoot. One way to fight this is by increasing your buffer’s mass to help slow down the bolt carrier group. One of the nicest, heavier buffers out there is the Spikes Tactical ST-T2 which is filled with HDTP (High Density Tungsten Powder) to combat that “clanking” multiple piece design from other manufacturers. This makes it a more fluid action during cycling. Now, time to talk about downside. You have increased your overall weight of the rifle as well as increased the reciprocating mass. This isn’t a solution but instead a mask. 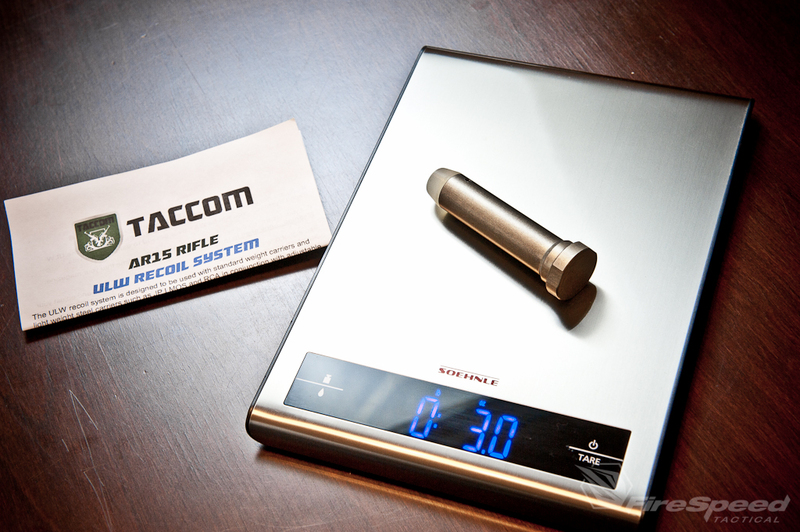 The Carbine standard buffer weight is typically 2.9oz-3.0oz, ours came in at 3.0 flat. The Spikes Tactical ST-t1 weighs 3.0 as well but the difference is that it is filled with LDTP (Low Density Tungsten Powder) to smoothen the action and reduce the noise during cycling. 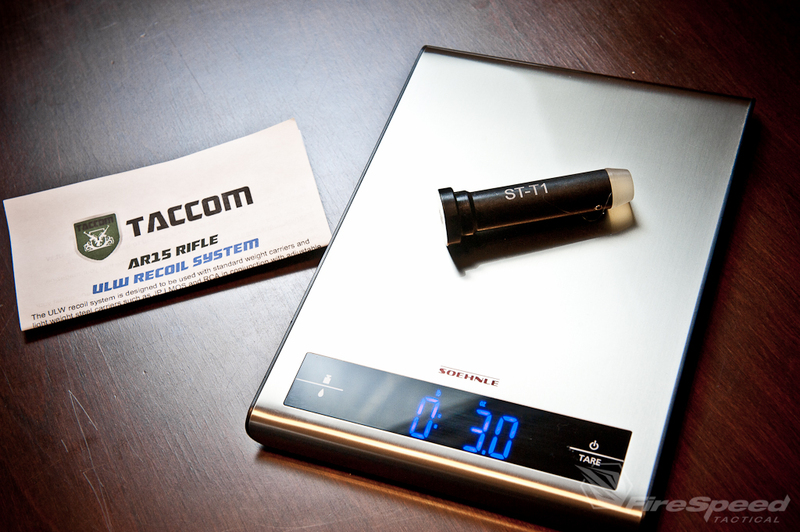 The Total weight of the Taccom system is 1.2oz, but here’s the fun part. The reciprocating mass is ONLY .6 OZ!! That is a significant amount of savings that is getting thrown into your shoulder. When you go to setup your rifle be sure to REDUCE / LIMIT / CUT OFF the gas that is returning to your system. Then you can slowly start opening up how much gas is getting returned back into the system. This is to prevent damage to your firearm!! 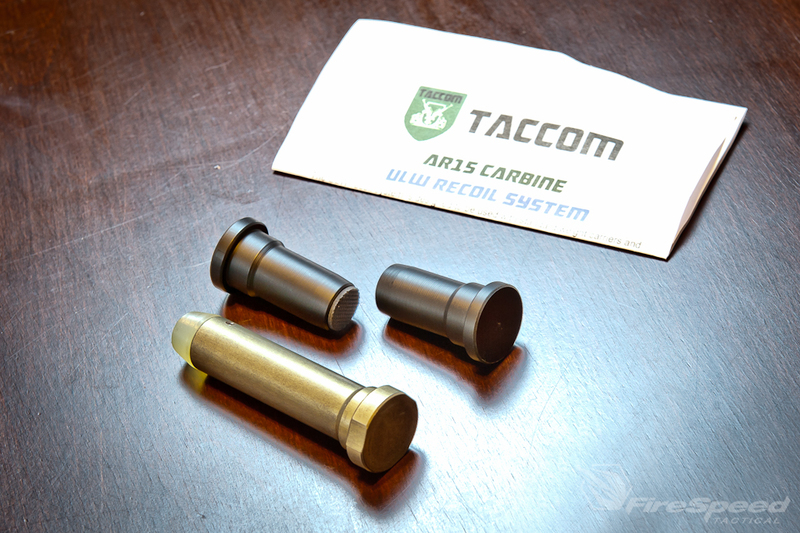 Taccom also makes a Rifle ULW Recoil System for folks that are using a2 based buffer tubes. 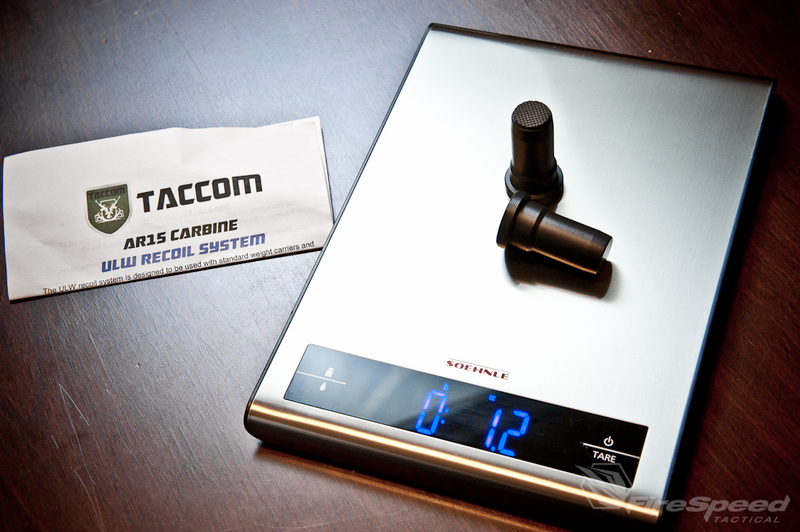 Here’s some fun additional info I learned from Tim, owner of Taccom. The ‘BUFFER” was originally designed for the M16. A closed bolt machine gun, where timing was EVERYTHING. The bolt HAD to be closed before the trigger’s hammer went forward. The “BUFFER” was designed with internal moving weights to help control the bolt bounce due to the high rate of fire of the M16. That buffer design is not required for the AR15 since it is a semi auto rifle. You can not pull the trigger fast enough to get ‘hammer follow’ or even hit the firing pin as the bolt is bouncing back… and they ALL bounce, by the way. Let’s say you are pretty fast on the trigger… lightening fast, like .11 split (shot to shot) …that’s about 9 rounds a second or 540 rounds per minute. Well, the M16 can do 900 rounds per minute and up to 1200 rounds per minute. The M4 cyclic rate has actually been reduced for our military down to about 600 rounds per minute to make that firearm more reliable in the field. BTW… if you can do 540 rounds per minute, you are about 100 rounds per minute fast than Jerry Miculek. Food for thought…..name one commercially (or military) produced semi-auto rifle that uses a “BUFFER” with internal moving weights. You can’t? Well, neither can I. Great information on how it comes together and allows you to make the most of your setup! If you don’t feel like reading, here’s a video for you to watch about our results and install of the system.